As far back in history as 1444, when the Worshipful Company of Leathersellers, one of the original Livery Companies (Guilds) of the City of London were granted their Royal Charter, deer as a raw material was a significant portion of the leather produced in England. Sheep, and deer feature in the coat of arms. At that time, every town or village had a tannery. As production systems over the centuries have become more mechanised, allowing bigger production batches to be processed, customers have begun to see leather more as though it were any other type of fabric, some not understanding that it doesn’t come from an endless roll, but is produced from skins, a by-product of meat production. Tanneries have turned from cottage industry to multi-million pound companies with massive working capital and highly demanding customers. 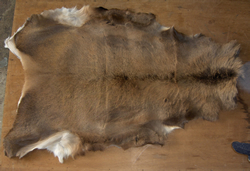 In terms of hide or skin quality, hides from oxen and skins from sheep or perhaps goats benefited by the fact that they were domesticated animals and the husbandry applied in their farming improved the quality of their skins from the tanners’ and leather users’ point of view, with less evidence of damage, scratches and scarring caused during the animals’ life. During the middle ages, venison was a popular meat to offer at any banquet. Commercially, over the years, this popularity waned in favour of the domesticated species, available in ever increasing volumes. During the intervening period, the only deer leather that has been made has been the result of small numbers of skins, badly preserved after rough shooting or seasonal cull, being handled by cottage industry typically. The result of this is that the leather generated by these skins is typically low in quality and suitable for the hobby market as opposed to a focused commercial venture. Preservation of the skin (primarily by salting) within a very short time after removal from the carcass is critical, to avoid any bacterial action degrading the protein content (which is eventually chemically stabilised to become leather). Rough shot deer of a range of breeds are still not a sufficiently consistent source of raw material for commercial leather manufacture. Major damage will result to the skin if not effectively treated by a “curing” process within a short time of removal from the host. This potential for the quality to deteriorate so quickly is one of the main reasons that culled stock or sports shooting does not offer the tanner a good return on his investment in processing. Sika deer are the larger end of the species and produce skins of a size that enable the tanner to achieve a reasonable return on his efforts. Raw material is bought either by weight or by the piece and sold by the square foot, so, the bigger the “yield” of leather from any skin, the more it will offer as a contribution to the business. We have moved in recent years into an era where deer are commercially farmed, to produce venison for restaurants of haute cuisine and the premium end of the branded supermarkets. As a very low-fat source of protein, venison is steadily becoming more popular. Just as the influence of husbandry influenced the quality of ox and sheep skins (so improving the resulting leather) deer are being farmed and slaughtered commercially. This presents a large opportunity for getting the preservation right, before the skins deteriorate, offers the farmer and custodian of the DEFRA licensed abattoir a possibility to sell their by-product as a useful and consistent raw material. ALC Ltd has developed a range of technologically advanced leathers from farmed deerskins of domesticated red / sika crossed livestock. 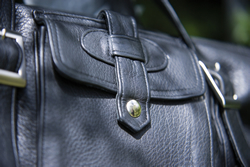 The leather produced offers advanced properties to the user, incorporated in outer garment products bags and small leather goods, by virtue of ALC’s intimate knowledge of the process and how to engineer-in special properties, such as water resistance. 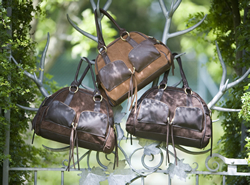 ALC deer leather (cervine) products are aimed at the top of a niche market, where “Englishness” is important and the consumer attributes a value to the provenance, being grown in England, tanned in England and the ultimate products being cut & sewn in England. The prime market is companies manufacturing articles for the “country set” or those individuals who would like to appear country-wise, with a high disposable income, who spend some time either hunting or fishing, perhaps both – and want to both look and feel the part. The finest english deer leather is a lifestyle choice.